Southern In Law: Happy 18th Birthday, Katrina! Today my not so baby sister turns 18 and it is totally weird for Jesse and I to have her reach this milestone. Despite often bickering and fighting, we are sisters who are incredibly close - and we've always been that way. We have a close family who does everything together, so naturally we spend a lot of time together. Once we got home from Bali Katrina even said how odd it was to not have me around and maybe she's changed her mind about wanting me out of the house ASAP as she missed having me around. I'm the one she comes to talk to about everything (even if I'm working and mmm... yuh... uh-huh-ing and not really listening - sorry!) and someone who has always been there. Katrina was born when I was 3 years old - so naturally, having a real baby doll in my life, I wanted to be Mummy's little helper. Even though I had to give up PlayDoh (I was only allowed to colour or play with playdoh in my room as Katrina would eat everything) and didn't get quite so much attention, I loved her and as I got older, I got more and more protective of her. I've watched her changed from a little baby into now a young woman - though I'm still not accepting that yet (that makes me too old :P) and I've seen her conquer challenges that none of us should have to face. Sure a lot of the time her attitude drives me nuts, but I love her more than anything - and I won't let anything hurt her. Sisters have a bond that no one without a sister can understand - you can think you hate each other's guts whilst still loving them more than anything in the world. She witnesses me at my weirdest - my doody dances (and that sounds awful, but "doody" is just a sound that you do whilst doing the doody dance - a happy dance on steroids), Jesse and my randomness, my made up songs, my hysteric laughing over nothing and my absolute inability to take a photo without pulling hideous faces... case in point, above. And the best thing of all? I've been able to see my husband develop a relationship with my sister (as well as my entire family) and even though they sometimes bicker like a real brother and sister - they are really close and it makes my heart super happy. We are a true family and I don't think there's much more you can ask than that. My parents have done an incredible job in ensuring we're all happy together as a family unit and I wouldn't change our family for the world. Be careful with everything in your life - don't be overcautious but realise that every action has a reaction. The decisions you make in your life alter your future, so it's important that you're always thinking ahead, rather than looking behind. Don't hold grudges this is one that will be the hardest for you, but the most important. People make mistakes - but people also change. The only thing holding a grudge does is make us bitter, so be a bigger person and forget about it. Only think about how you can better yourself. Never say never you've watched me conquer so many things everyone said I could never do and I want you to be able to do the same. When someone says you can't, think about how you can - there are always going to be challenges in life, but there's nothing to say you can't overcome them. Marry your best friend and don't settle for anything less. Your husband needs to be someone who makes you impossibly happy and who you're happy doing absolutely nothing with. Plus, your future husband needs to be lectured by your brother in law first - as he's told you a million times. Don't be like me it's not that I've done anything wrong, it's that you're not me - and you need to remember that. There is no comparison between people who are totally different. What I achieve is different from what Jesse achieves - just as what you achieve is different too. Be your own person and achieve your own goals - that is what makes you happy. 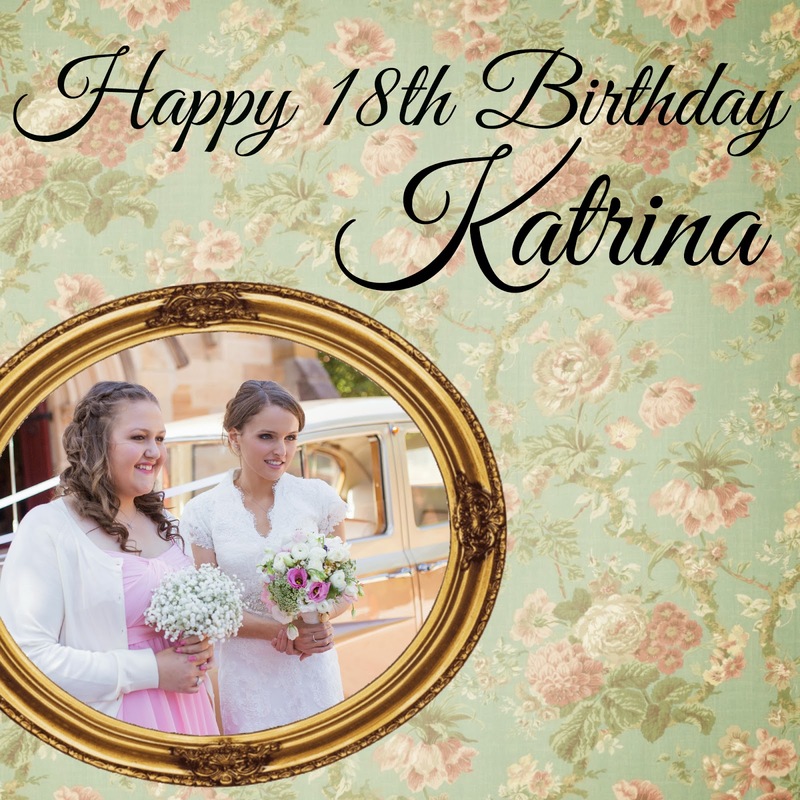 Do you have any advice for Katrina on her 18th birthday? Oh Rebecca, you are too sweet!